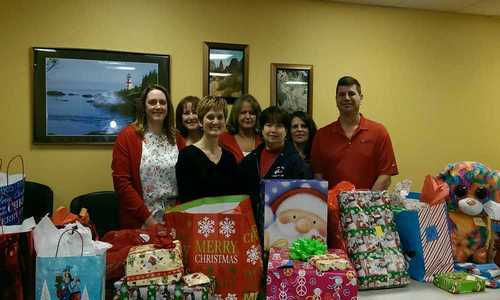 The members of the Vestal Elks Lodge #2508, partnered with the Agency this past Christmas to buy presents for those less fortunate families served by Catholic Charities. The Elks dropped off a van full of presents to Catholic Charities at the Walnut Street location for staff to deliver to 125 children in 60 families that are served through the Youth, Family and Community Division. Beginning in early December, members select tags off a giving tree and then spend the day buying and wrapping presents. The lodge raises money throughout the year that allows them fulfill these special Christmas wishes. "It's what the Elks do to try and make the community a better place” said Chris Battaglini, Elks Lodge member (front row, far right). “It is the number one goal of our lodge here in Vestal to help the community and that makes us all feel very good." Teri Geisenhof, the club's President (front row, right) said, "It's a wonderful feeling and I feel very blessed that I'm able to do this. Giving back to the community is very important for me as it is for the rest of our Elks members. We have a saying, ‘Elks care, Elks share’ and that's very true." This is the 6th year the Elks have teamed up with Catholic Charities to provide presents. We extend our heartfelt thanks to the entire membership.